Contractures refer to the permanent tightening of tissues. This includes muscles, tendons, ligaments, or skin. It makes it hard or impossible to move the nearby joints. Spasticity is a change in muscle tone. It is caused by injuries to the brain or spine, such as stroke. 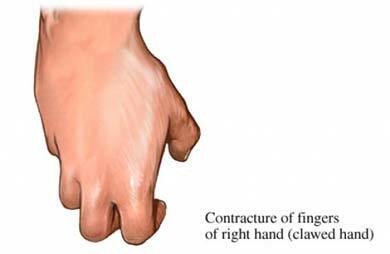 It can often lead to contracture. You will be asked about your symptoms and past health. Your joints will be examined for range of motion. Images may be taken of your bodily structures. This can be done with x-rays . Physical therapy can helps to increase mobility, joint elasticity, and muscle strength. Occupational therapy can help bring back movement to do daily tasks. Casts or splints can keep the joint in a better position. They may help to stretch soft tissues. They are often used for contractures cause by nerve injury or immobility. Casts need to be changed on a regular basis. Surgery may be needed to release tight tendons, ligaments, and joints. This may be used if other treatments have not worked well. Aggressive care of issues like rheumatoid arthritis may also delay or prevent contractures. Fergusson D, Hutton B, et al. The epidemiology of major joint contractures: a systematic review of the literature. Clinical Orthopaedics & Related Research. 2007:456:22-299. Huckstep RL. Management of neglected joint contractures. Clinical Orthopaedics & Related Research. 456:58-64, 2007 Mar. Occupational therapy's role in skilled nursing facilities. The American Occupational Therapy Association website. Available at: https://www.aota.org/-/media/corporate/files/aboutot/professionals/whatisot/rdp/facts/factsheet%5Fskillednursingfacilities.pdf. Accessed December 31, 2018. Skalsky A, McDonald C. Prevention and management of limb contractures in neuromuscular diseases. Phys Med Rehabil Clin N Am. 2012 Aug;23(3):675-687.